This morning I took my very first Bikram Yoga class, and I am glad to say that is was very doable. No fainting, no nausea, no collapsing, and no dying (hurray!). I like to think my Mexican roots make me more heat resistant, and ofcourse I was very well prepared (hydrated and with an emptyish stomach). Don't get me wrong, I'm not saying I was any good at it. My body could by no means be called flexible and my standing leg was as wobbly as a bowl of jelly pudding. But afterwards I felt GREAT and I now get how that feeling is highly addictive ('look at the sky! I see clearer! I love this fresh air! I can smell better! I love everyone! Why the hell is it raining again and why are all these tourists clogging the bike lanes!'). Well, let's see how I hold up at my second class. In the meanwhile I am on a slight 7 day detox of only fruits and veggies (and lots of green monsters), battling a last few excess pounds. So no recipes from me for you, even though I am very anxious to try some of the delicious recipes in my recently acquired copy of Veganomicon. And I need your help. I picked up my vegetable subscription today and while unpacking at home I was confronted by a very intimidating killer monster sized head of endive (which has, in my humble opinion, no legit reason for being in a one-person-veggiebag). What's a girl to do? 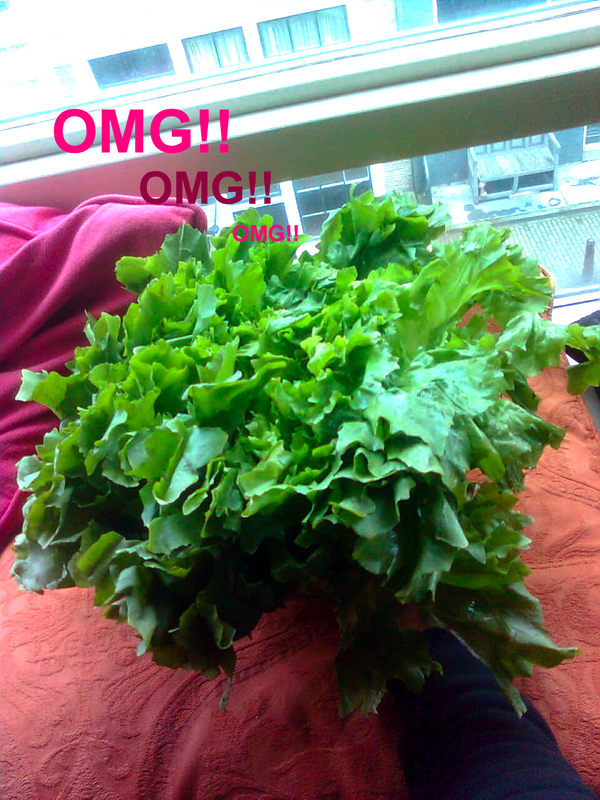 I cannot eat all of it as a salad, I'll turn green! Oh dear, we get those monster endives in our 2-person bag as well. We sometimes get as many as four 2-person meals from one of those. 1. Invite people over to come and share your delicious endive creations. And I love indonesian 'toemis andijvie' but I'm not sure whether you can have that during your detox? (Oh, and half a dl of oil is of course nonsense: you could use a little of just a little water to 'fry' your onions in). Stir-frying with leek, apple and 'nasi kruiden' is nice too!